In the days before the Japanese Revolution, Hiko Seiijuro, a wandering master swordsman and hermit, encounters a bandit raid on a slave wagon. Hiko kills the raiding bandits in hopes of saving as many lives as possible, but only manages to spare one life from the massacre. Hiko leaves the child, advising him to go to the nearby village and have them take care of him. A few days later, as Hiko comes back to check upon the child he saved, he is shocked to see the child had created graves, both for the slaves he befriended and the bandits who killed them. Seeing potential in the young one, Hiko takes the child under his wing, names him Kenshin, meaning "heart of sword," and teaches him about the art of swordsmanship under the Hiten Mitsuruugi Ryu. 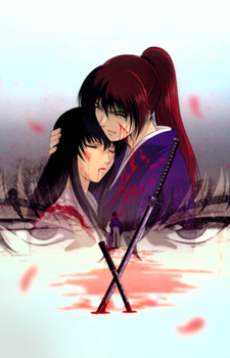 Struggling in a constant challenge with his ideal beliefs reflecting against the harshness of reality, Tsuiokuhen tells the melancholic and dark story of Himura Kenshin as one of the most feared assassins of the Japanese Revolution: the Hitokiri Battousai.